Let's start today with a quote from Walt Whitman. If you are in Phuket today, I surely hope you will seize the day. The sun shines, the air is warm, the ocean calm. One of those perfect low season days. Yes, it's not always like this, but the last few days have been sunny, the winds have calmed (Monday was still quite blowy). Gather ye rosebuds while ye may. Of course I seem to have picked up a little cold from somewhere. My daughter got sick on Sunday night and has been off school for 3 days. Normally she never gets sick, a tough bunny. And can I seize the day? Nope, working. I am jealous of all ye holiday makers! I had to get to the office early this morning, and rode over Patong Hill about 7:15am. 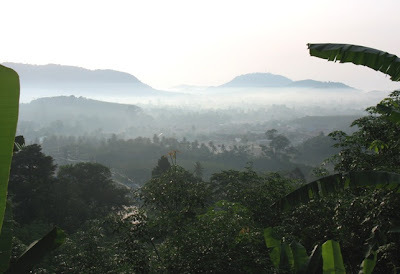 As you climb from Kathu up the hill, the early morning views full of mist are beautiful. One of my favourite views in Phuket.